If you happen to eat a full course meal in south India, you never start your meal without rice, paruppu (lentil) and ghee on your plate / banana leaf. It is one of my favorite parts of the meal because it reminds of my childhood. Every baby grows up eating this everyday. Why? Because, it is a complete meal in itself served with some veggies on the side. 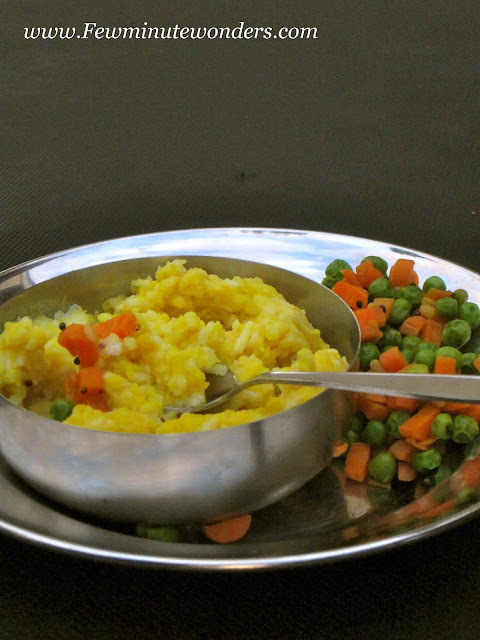 Lentils bring in the protein, rice has the carbs, ghee has the fat and the veggies on the side adds the fiber to the meal. This is a vegetarian's comforting and nourishing food. This also happens to be what my family enjoys the most. I absolutely have to keep some paruppu or lentils on the side for them to enjoy it before they go on to the rest of the meal. So I decided to share this on my blog. Here is the recipe if you are just going to make paruppu sadham for 2 people. 1. Clean the rice with water 3 times. Add the required amount of water as per the instructions. Pour some water into the rice cooker. Place the bowl of rice and water cover and cook until its done. 2. Pressure cook the lentils with water and turmeric powder. 3. When rice and lentils are cooked, mix both rice, ghee, lentils and salt and mix well, when hot and serve it hot with veggies. Delicious and comforting rice. Nice Presentation. It is absolutely a very simple and comforting devamrutham food.I too love parupu sadam very much and never miss out whenever parupu is available. Comfort food for all ages. A food that you can never get bored of! Lovely picture too. Nothing will beat this paruppu sadham, i never failed to prepare them atleast once a week,just love it. I think I can have this every single day.. Perfect comfort food, looks inviting ! !